(roots, reggae) - Veteran performers and recording artists Jimmy Dillon and Lorin Rowan have been playing music for many years, as they rejoin forces with a group of talented singers and players to form San Francisco Music Club. 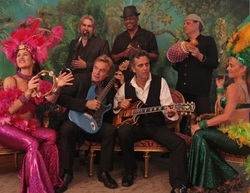 The San Francisco Music Club, led by Dillon and Rowan (who were founding members of Marin County’s own The Edge), have now transformed their high energy rock/reggae sound into an exciting and colorful cross pollination of styles and genres; a world music experience that draws from Afro-Cuban/Hi-Life, funky New Orleans grooves, R&B, and classic Jamaican roots music reminiscent of Bob Marley & The Wailers or Toots and the Maytals. Think Paul Simon’s Graceland with an extra helping of Red Beans and Rice, a side of Gumbo, and a Red Stripe.